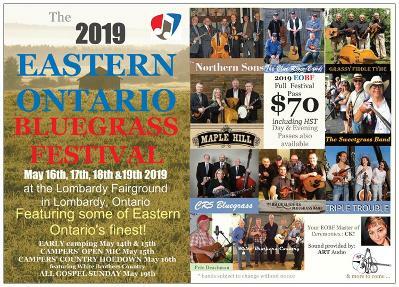 The Eastern Ontario Bluegrass Festival is pleased to present another superb roster in 2019! get your 2019 EOBF "full Festival pass" in our on-line shop starting on Friday, Dec. 7th, 2018. Thursday May 16 the 2019 EOBF Campers' country hoedown! White Brothers country! Always entertaining, This group will grace our Thursday night stage once again in 2019. Bring your dancin' boots, this band always gets people out of their seats and onto the dance floor. pete Deachman! pete is one of the best singer/song writers around. he always engages the audience with original and cover songs that mean something to him and by the end of his show, they will mean something to you as well! Triple Trouble! 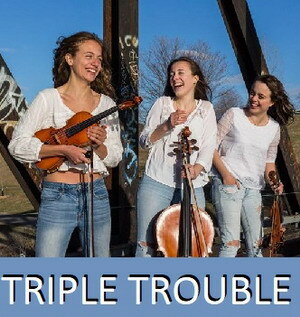 from Ottawa, These siblings are all accomplished musicians who will bring smiles to your faces with their instrumental & Vocal prowess and high energy step dancing! 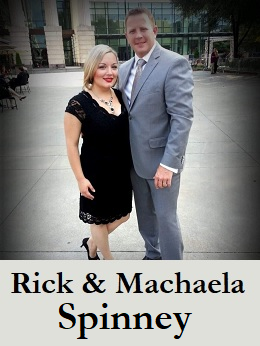 Rick and Machaela Spinney are a husband and wife duo who thrive on the vocal blend of Duet singing. They have been performing together for over 15 years. Rick Spinney, formerly of the Canadian bluegrass band, The Spinney Brothers, has toured extensively for 25 years covering the North American map and performing on some of the most prestegious stages in the business, Stanfest, Merlefest, 6 consecutive years on The Danny Stewart Bluegeass Cruise as well as the IBMA awards show in Raleigh, NC where they were nominated twice for emerging artist of year. He is a 5 time banjo player and entertainer of the year and is an accomplished song writer and member of the Nova scotia country music hall of fame! Machaela began singing at a very early age with her two older sisters and began to be recognized as a stand out performer throughout Nova Scotia. She formed and fronted her own bluegrass band, "Machaela Taylor and Borderline Bluegrass" touring throughout Eastern Canada. She has one solo album titled "Old Love New". Machaela was nominated for female vocalist of the year at the East Coast Bluegrass Music Award's! The blend of harmony, song selection and stage show are the strengths of this "new" duo. with a fresh exciting style that We're sure will be welcomed by industry leaders and fans alike and We are absolutely thrilled to welcome rick & Machaela Spinney to our 2019 eobf stage. If you are a fan bluegrass, country or Gospel music, we know you will enjoy this duo! 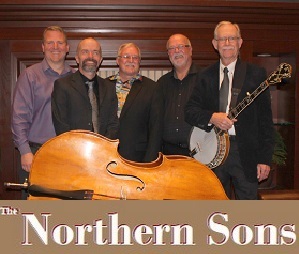 This Toronto based group consisting of Chris Quinn on Banjo, Dave Lang on Bass, Scott Neary on Guitar and Vocals, and Graham Mansfield on Mandolin and Vocals, combine forces to bring you the classic sounds of The Stanley Brothers, Bill Monroe, and The Kentucky Colonels among many others. By all reports, these boys bring "it" With a repertoire that consists of all the bluegrass classics and then some! 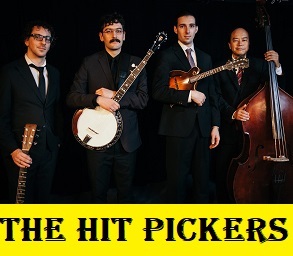 Quickly becoming a staple of the Toronto bluegrass scene, The Hit Pickers can be found at their Tuesday night residency at The Cloak and Dagger Irish Pub on College Street. So if you're looking to hear a blazing breakdown, a beautifully lonesome ballad or vintage inspired original compositions, just open up your ears and let them take you back to an evening long ago. We welcome the hit pickers to our 2019 EOBF line up! 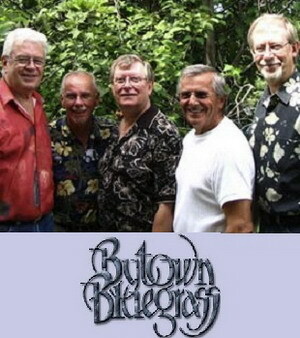 From their initial stage appearance in 1974, right up to the present day, the Ottawa-area band Bytown Bluegrass has consistently offered fans the very best in acoustic music. 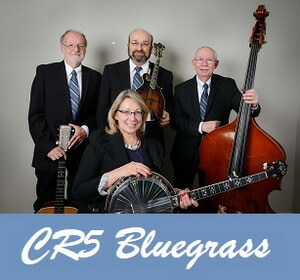 The "bluegrass" style defies definition, but those who consider themselves bluegrass devotees certainly find plenty to like in the repertoire of Bytown Bluegrass. And the same is true for those whose first preference might be country, folk, or alternative acoustic music. Their initial single recording, "Casey's Last Ride", released in 1979, still receives significant airplay, and brought the group nomination for a Canadian Country Music Association award in 1980, a rare honour for Canadian bluegrass bands. They ceased touring on a regular basis in 2012 but do re-assemble on occasion. We are pleased to have Ottawa Valley Country Music Hall Of Fame members Ray & Glen Adams, Neville Wells and Don O'Neill along with John Richard grace our stage for a 2nd time! also: a special guest appearance by accomplished composer, singer and musician, laurie LaPorte-Piticco! stay tuned..
General Store, the former CCBA Most Promising Group and 5 time CCBA gospel group of the year award winners, played their farewell concert back in December of 2012 in what was to be their final performance. 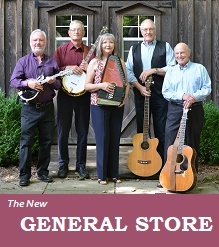 We have some great news for fans of this perennial favorite and for bluegrass music lovers: "The New General Store " will be hitting the festival circuit once again in 2019 and what better place to start than right here on our Lombardy stage? this newly reformed edition, consisting of original members Brian Riseborough, John Perkins and Helen Lewis, along with Larry Miller and Gene Gouthro, are set to thoroughly entertain our festival goers with dynamic instrumental dexterity, wonderful lead and harmony singing and a wealth of performance experience.! 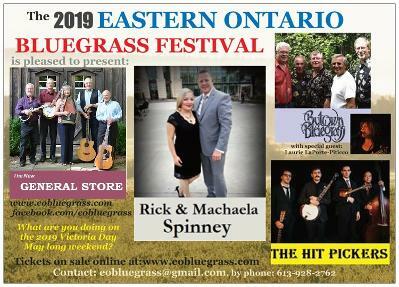 Appearing May 18th at the eastern Ontario bluegrass festival! 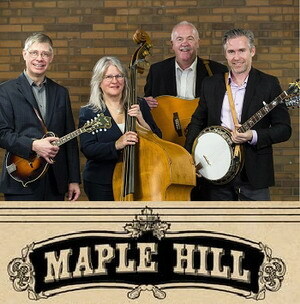 Maple Hill Bluegrass is a multi-award-winning bluegrass band that brings energy, emotion, fun and the lost art of entertainment to their show. Built on the foundation that "it's all about the song", this band delivers powerful vocals with strong supportive instrumental backup, rooted in a traditional sound. The band is comprised of co-founders Garry Greenland (guitar & vocals) and Pat Moore (bass and vocals), Kevin Golka (mandolin & vocals) and Sean Lundy (banjo). Heart, drive, deep blues, inspiration, a tight vocal blend, fun filled interplay, and an intimate relationship with the audience are some of the things that describe a Maple Hill performance. we are happy to have them share their superlative skills and showmanship with you this coming May on our 2019 EOBF Main stage! individually, Thom Gardiner is a 5 time ccba male vocalist of the year, a 4 time composer of the year and has a guitar player award to his credit. Chris Wilson has a fiddle player of the year award of his own as well as numerous awards from various competitions from across northAmerica. spokesman marty coney (bass), Ottawa valley country music hall of fame member glen adams (banjo), and the multi faceted Bill henry (Mandolin) round out what is one of the most popular and closely followed acts to ever come out of Ottawa. we look forward to seeing them in Lombardy once again in 2019! we welcome back The 2014 ccba MOST PROMISING GROUP, The Sweetgrass Band! 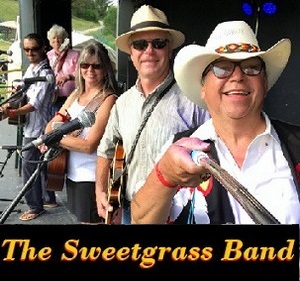 They have been together for about Eleven years now and have made many Fans and friends as they have been performing their brand of "bluegrass with an edge" at many of the country & bluegrass festivals throughout the province. this has resulted in a very good following of self-proclaimed "sweetgrassers". The current members are 5 time ccba nominee for female vocalist, Ginny McIlmoyle (guitar & vocals), Jimbob Marsden (bass & vocals), John Partridge (banjo, guitar & vocals), 5 time ccba and honor roll member for guitar, Marc Roy (Guitar, fiddle, bass & vocals) and Roland Barlow (mandolin & vocals). They enjoy each other's company and it shows on-stage during their performances. 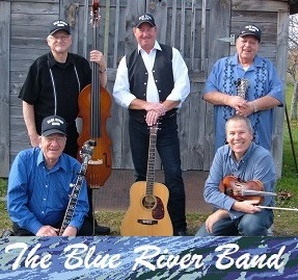 Always a crowd pleaser, the blue river band has been a staple on our EOBF main stage since it's inception back in 2016. bluegrass veterans buddy clark and jim Mayville, along with band mates scott Roberts, ray Desjardins and peter Anderson always put on a display of good, hard driving bluegrass music which has made them audience favorites across the province. In the words of Mayville: "We may diversify from time to time but always with the intent of keeping the audience entertained with music they can relate to". and entertain they do! we are happy to have them return once again in 2019! This group got started roughly Thirteen years ago at Findlay Ridge when Gerry André (MC, Guitar, Vocals) said to Bernie Lefebvre (fiddle) that he had put their name down to play on stage. he stated that "all the songs have been sung so we're just going to play fiddle tunes". They quickly put a set together and grassy fiddle tyme was born. Along with fellow musicians Ron Clark (guitar, mandolin, vocals) and Floyd Bauder (bass, vocals) this group collectively has over two hundred years of musical experience! 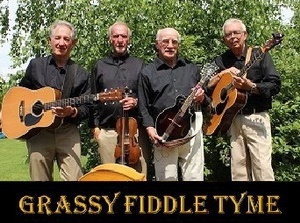 you're in for a good time with the music of grassy fiddle tyme! from Stittsville, the father and son pair of Terry & Jason McDonald (bass & mandolin respectively) have created one of the newer groups from the Ottawa area. with the McDonald tandem and band mates Ed Sexton (Guitar, banjo) and Warren Recoskie (Guitar) sharing the vocal load, along with don fletcher providing great "old time fiddle" fills and leads, this group has developed an authentic sound that defines bluegrass and old time mountain music. 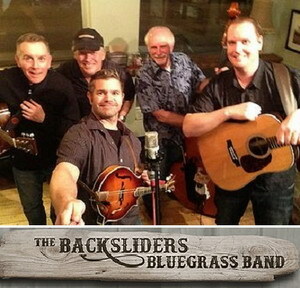 The Backsliders Bluegrass Band have been gaining in popularity for the last couple of years appearing at music festivals and other venues throughout eastern Ontario and we are pleased to be able to present them to our festival goers again in 2019! From humble beginnings as a Wednesday night jam group from homes along Leeds-Grenville County Road 5, your host group, CR5 Bluegrass, are now a much sought after touring ensemble, playing at bluegrass, country and folk festivals, fairs and other venues throughout the province and parts of Western Quebec. Recipients of the "Most Promising Group" award at the 2018 central Canadian bluegrass awards and also nominated for 2018 ccba Best gospel group, Their premier CD of all original material, “Up North”, earned them a CCBA nomination for “Best Recording” back in 2016. With their signature sound and extensive repertoire, they never fail to entertain. Always in demand, always a crowd pleaser! stay tuned, More details about the 2019 EOBF are coming!